Historically the most popular area with international buyers in France, the Dordogne in South-west France continues to receive great interest from all over the world, particularly from the UK, and it is not hard to understand why. People are not just buying a house, they are buying a lifestyle. The Dordogne is hard to beat as far as quality of life is concerned. Beautiful countryside with a low population density, lack of pollution, a temperate climate, fantastic food and wine, good health and education systems and welcoming people are just the beginning. Flanked by the Lot river to the east and the vineyards of Gironde and St-Emilion to the west, the area is known for its prehistoric sites, natural beauty, and its world class gastronomy that includes confit de canard, truffles and fine cheeses. The Périgord is a former French province which corresponds roughly to the current Dordogne département, located in the northern part of the region of Aquitaine. 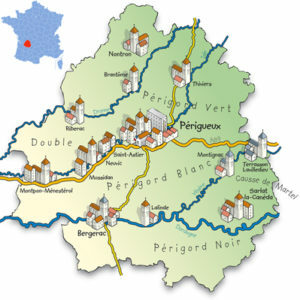 It is divided into four areas called the Périgord Vert in the north (named after the verdant landscape), Périgord Blanc in the centre (clay soil), Périgord Pourpre in the southwest (named after the colour of the vineyards in the autumn) and Périgord Noir in the southeast (truffle country). Traditionally the north of the region (the Périgord Vert) offers a more rural environment with fewer larger towns. The most famous part of the Dordogne is the south east (the Périgord Noir) and has built a strong reputation for excellent tourism and visitor attractions as well as being where the most beautiful châteaux can be found. Property pricing varies quite considerably from one area of the Dordogne to the other. The Périgord Vert is the cheapest part of the region but even within it there are price differences. For instance, the North and North East areas bordering the Limousin are a lot more affordable and are perfect for those seeking a property with a decent amount of land on a restricted budget. 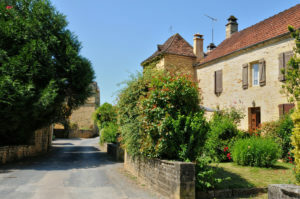 The southern areas of the Périgord (namely Périgord Noir and Périgord Pourpre) are more expensive, offering easy access to many medieval market towns. They are still strong favourites for people looking to purchase a French gîte business due to the many attractions close by. 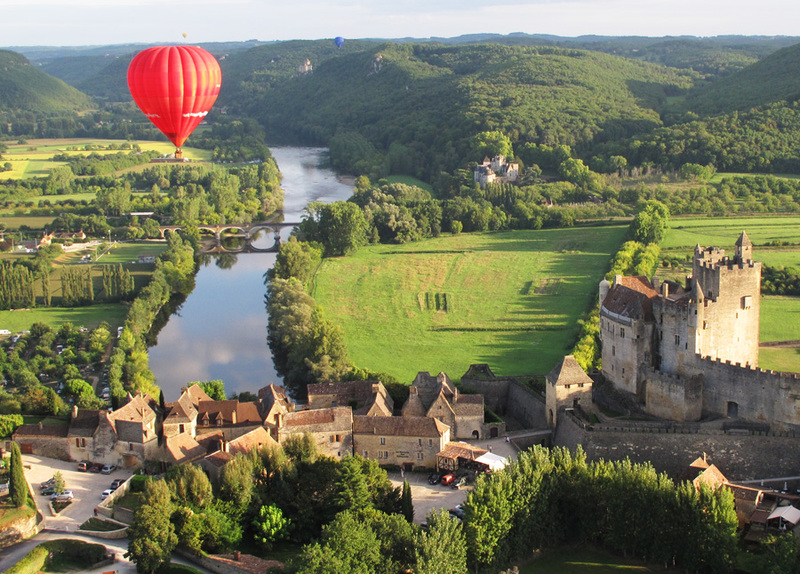 Begin your Dordogne and Périgord property search here. Dordogne enjoys a temperate climate, with local variations, with temperatures and rainfall varying not only in broad bands across the department, but also within quite small areas. More detailed information on the climate in Dordogne here but below are average temperatures. By road, the region is easily access from Paris through the A20 motorway. Those travelling from the northern French ferry ports such as Calais will have an 8-10 hour drive. Whether you are looking for a holiday home or a permanent residence, there is everything to suit every lifestyle and budget. Do you prefer nature and wildlife or shops and culture? How are your French language skills? Do you want to be able to walk to the village shops or jump in the car to drive to the nearest boulangerie and boucherie? If your French is not up to scratch, then you might feel isolated in a rural area. Although there are English people all over the Dordogne, the most established communities are probably to be found around Verteillac, Riberac and Bergerac. If you are just popping over for a few weekends a year to recharge your batteries, then perhaps the steep wooded hillsides of the Périgord Noir would suit. If you prefer the sweeping landscape of rows of vineyards, then look south of Bergerac, or if you like the idea of farming and woodland, rolling hills and small valleys, then head towards Riberac. For a regular cultural fix, keep close to the A89 motorway between Périgueux and Bordeaux – here you will have easy access to larger towns, or to catch the train to Paris. Much the same applies to shopping. The region has its good shops for your everyday needs, but you will need to go to the larger towns for any serious urban style shopping. A stone house with plenty of character features such as stone fireplaces, beams, and French shutters. Depending on size, state of repair and location this type of property typically costs between€250,000 and €450,000. Stone properties within walking distance to the typical French café/restaurant and a feeling of being part of the French community. 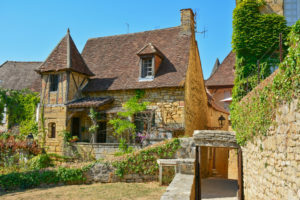 Small village houses without outside space can be found for as little as €80,000 while some grander restored townhouses in some of the most beautiful villages of the Dordogne go for between €200,000 and €500,000. 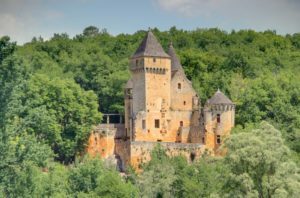 The Dordogne is historically a very rich area of France and therefore you will find a large quantity of château of various shapes, sizes and prices. An unrestored small château could cost from €500,000 to €800,000 while grander properties will typically cost from €1M to €4M. These are just examples of typical properties popular with foreign buyers but the Dordogne offers an even wider range of properties for sale, including more modern new-build properties. If you want to discover what is on offer you can take a look at some of the properties we currently have available for sale. Is the Dordogne full of British people? The Dordogne is popular with both holidaymakers and British and American buyers so there is little doubt that you will come across other English speakers. However, the Dordogne is also really known for its “Frenchness” with beautiful traditional French stone houses, its great gastronomy, warm long summers and a very strong sense of community from the locals. 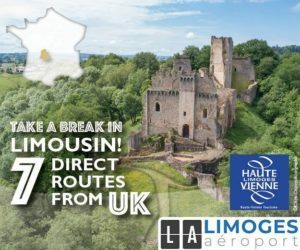 There are some pockets more popular with British expats, however this is not always a bad thing when you are relocating and it can help you integrate more easily into your new French life. Does it snow in winter in the Dordogne? A few years ago there was snow in May on the Côte d’Azur. So yes, it sometimes snows in winter in the Dordogne. However, the weather is usually much dryer and warmer than anywhere in the UK (see our climate data above). Can I buy a barn to renovate for €50,000 in the Dordogne? A decade ago, there were many barns/stone houses to renovate coming on the market at bargain prices. However, the success of the area with foreign buyers means that many of these properties have now been renovated. There is now a bit of a shortage of cheap stone renovation projects. Can I buy a house for €150,000 in the Dordogne? Of course. However, you will have to have realistic expectations in terms of your property requirements and its location. Prices vary greatly from one part of the Dordogne to the other, with properties north of Bergerac tending to be cheaper than those in the south of the Dordogne. If you’ve got your heart set on a French property in the beautiful Dordogne a phone call to the FrenchEntrée Property team is a good place to start. If you would like some assistance discovering this area of France and would like to find out more about what the property market has to offer please don’t hesitate to give us a call at +44 (0) 1225 463752 or email us at propertysales@frenchentree.com. Did you find this guide useful? Get FREE regular updates with our French Property, Home & Life newsletter. Enter your email address here.